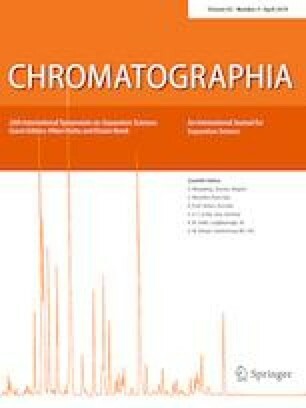 A simple and sensitive stability-indicating size exclusion chromatography method was developed and validated for the quantitative analysis of cetuximab. The effect of variety of parameters including mobile phase composition, pH, flow rate and injection volume was investigated to achieve acceptable peak resolution and the optimum condition was selected. The proposed method was validated in accordance with the International Conference on Harmonization guidelines. Method validation showed good linearity over the concentration range of 1.56–250 µg mL−1 (r2 = 0.9997), acceptable precision (relative standard deviations < 2.8%) and accuracy (recovery of 97.6–99.5%). The limits of detection and quantitation were 0.34 µg mL−1 and 1.03 µg mL−1, respectively. The robustness of the method was evaluated by small variation in buffer composition, buffer pH and flow rate and was determined to be acceptable. Assessment of the specificity and stability-indicating capability of the method using thermally stressed, photo degraded, acidic and oxidative stressed samples revealed no interference between cetuximab and excipients or force degradation products. Furthermore, evaluation of bioactivity of stressed samples showed significant differences (p < 0.05). The proposed method could be utilized as a precise and robust stability-indicating method which can be reproduced in any labs for high-throughput quantitative analysis, stability monitoring and quality control of cetuximab in pharmaceutical formulation. This work is a part of A. Farjami’s thesis, submitted for PhD degree (no. 117) and supported by Research Council, Tabriz University of Medical Sciences and we would like to thank the CinnaGen Medical Biotechnology Center for kindly providing all of the cetuximab medicinal samples.